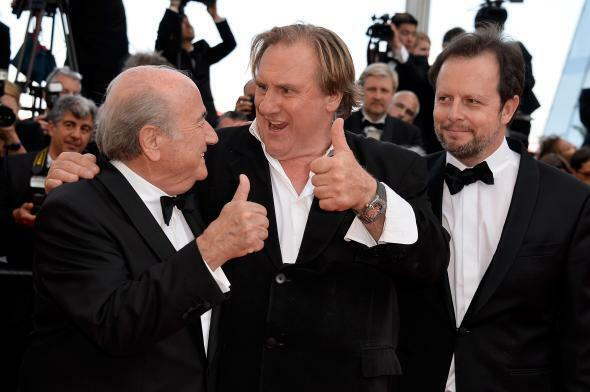 FIFA movie United Passions U.S. weekend box office was $607. Someday there will be a good movie about FIFA and the spectacle it has created for itself; FIFA, however, will not make this movie. Over the weekend, FIFA did give it a shot with the U.S. release of the film United Passions chronicling the origins of the organization, and its creepy uncle, advocate-in-chief Sepp Blatter. The movie, starring actual actors Tim Roth, Sam Neill, and Gerard Depardieu, hit theaters in America and, much like the 1986 Mexico World Cup, the response among American viewers was underwhelming. How underwhelming? The two-day box office gross for the film on Friday and Saturday was 607. Dollars. This numerical humiliation comes via the Hollywood Reporter, which also notes that one Phoenix-area theater reported a two-day gross of 9. Dollars. Just to break down the numbers a bit more because they’re funny: The film pulled in $319 on Friday and $288 on Saturday. That’s a 10-percent box office decline on Saturday. Word of mouth was obviously not kind to United Passions. The limited-release had something to do with the meager returns—it was shown in just 10 theaters in 10 cities nationwide—but let’s be honest: FIFA could have earned more money with a Kickstarter campaign asking people to donate to have theaters not show the movie. The movie’s estimated budget was in the $25-to-$30 million ballpark and has earned back only $200,000 globally during its six months in theaters.